I split the idea into three posts, one for each episode. 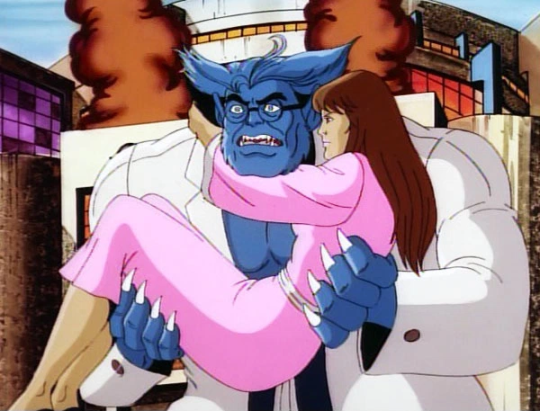 The second choice at random was episode 2, season 10, “Beauty and the Beast.” A blind woman, Carly, falls in love with Beast, who is working on a cure for her. The premise is perfect: she can’t possibly have any idea how he looks (and has a knack for sniffing out his aftershave!) while he can’t help but remember how he looks. While he certainly takes the high road – you know, instead of the one where he rips them apart limb by limb, simply because he can – I wonder from what the Friends of Humanity are so “sadly misdirected.” Such a phrase implies a good nature lay somewhere within grossly coarse action. But I don’t see it. These are the kinds of people who would fight for men’s rights or claim reverse racism. They’re at the top of the food chain and want more, and will insist that humanity works like a wolfpack to get it; who dismiss their prefrontal cortex because they’re afforded such a luxury in the position they occupy and for which they didn’t have to do anything to obtain. There’s also a moment where Carly’s father claims his concern simply stems from wanting to protect his daughter. It reminds me of Hasan Minhaj’s appearance on You Made It Weird with Pete Holmes, where he recounts living in the South and his prom date bailing on him because “what would the family think when they saw the pictures?” The worst part of the story, as he relays it, is he left the house understanding what his date’s mom said as if it made any sense. Catering to bigotry under the false guise of protecting someone or something is as terrifying as it is weak. It speaks to an individual in the most definitive, generalized sense possible. Nonetheless, maybe Beast sees something that I don’t yet. He’s the one who lives a dual life where what he embraces for making him great is simultaneously what causes self doubt and disdain. 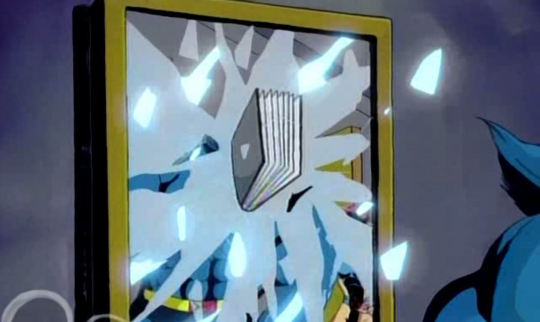 There’s a point in the episode where his circumstances break him, and he smashes a mirror with a book. He even breaks his reflection with an education. This is similar to Nightcrawler both in action and the response afterward. That these characters snap just like us is what qualifies their being more than anything. I assume a certain amount of how things wind up, with Beast saying that “some day with work and hope the world will change,” is because of the show’s 30 minute format. But the reality is Beast is burdened with an intense knowledge of which he can’t convince a sizable portion of the population. Re-watching these X-Men animated episodes as a fully grown and developed adult is mindblowing. I’m aware I’m projecting my daily experiences onto this kids show, but I think that’s the point. I think that’s what teaches a kid something is screwed up and what enables them to have an open mind when they move on from cartoons, and it makes me want to know more about what cartoons are presenting similar stuff right now. I hope it never stops happening.